Hurry! Only 6 places per workshop! 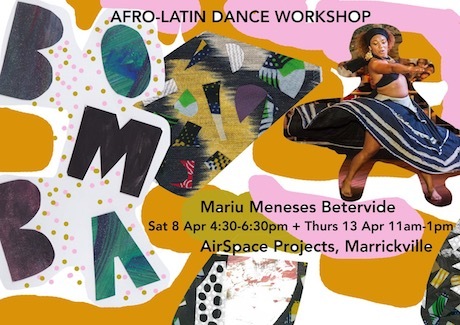 Afro-Uruguayan dancer and choreographer Mariu Meneses Betervide will give a dance workshop with a focus on the connections between movement, music and culture drawing on the richness of Afro-Latin dance traditions. Mariú has been performing and teaching for over 10 years both locally and overseas in various genres and styles. This fun and rhythmic workshop set to Afro-Latin music will introduce participants to her 4 elements technique, exploring Earth, Water, Fire and Air to explore creativity and open up body and sensory awareness. Includes short introductory artist talk by Paula do Prado. * Children aged 12 and above can join if accompanied by a parent or guardian. 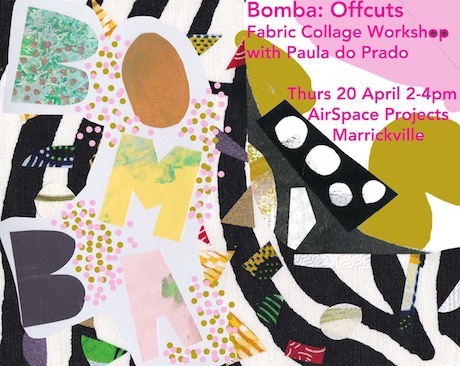 Join Bomba exhibition artist Paula do Prado for a hands on workshop turning fabric scraps and remnants into a work of art through collage. Often referred to as appliqué or reverse appliqué, you will be shown how to fuse fabric together using fusible webbing to design and create your own fabric collage artwork to take home. Whilst making you’ll be listening to some of the music that inspired the work for Bomba. The workshop includes an artist’s talk with a focus on the connection between “making do”, craft and keeping culture alive. No previous experience required as this workshop is suitable for beginners through to experienced crafters and makers. All materials and tools will be provided but if you have cotton or linen fabric you’d like to use or donate feel free to bring it in! * Children aged 12 and above may also register to participate however they must work in pairs with an attending parent/guardian as we will be using hot irons to fuse fabric together.